I have been fighting depression all of my life, been to countless medical professionals, taken just about every anti-depressant on the market, read countless books and articles on how to fight this condition but found little help in all of these areas. About a year ago, I decided to attend a course with the Alchemy Institute. Little did I know at the time that I would learn so many ways to help myself and others with the overwhelming depression that I have spent a lifetime fighting. I want to give readers a short insight into my life so that you may understand how my depression grew into a monster that paralyzed my life and how Alchemy has finally helped heal me. After my mother gave birth to me, she was taken to a mental hospital and I was taken to an adoption home. At the age of 14 months, my father’s sister and her husband adopted me. At the age of 3 years, my adopted mother and father divorced and I was placed in a Roman Catholic boarding school. 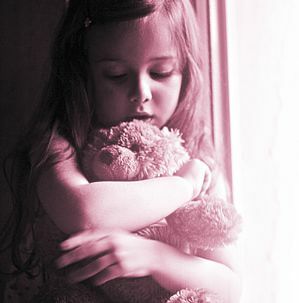 I was a very lonely child and can not remember ever being told “I love you”, or being held and feeling the warmth of someone's arms around me. I never owned a doll or any toy of my own for Catholic nuns did not believe in ownership of material things. I was taught at a very young age to do chores that were too much for a child of my years. I remember trying very hard to please in hopes of getting some kind of acceptance, praise, approval or any kind of reaction for my endless efforts to please. The only real friend I had was my imaginary friend “Jesus” whom I visited daily in the little chapel at the boarding school. I would look at his statue in the chapel, close my eyes and imagine him sitting in a chair and my head would be in his lap as he brushed my hair and wiped my tears telling me how much he loved me. I would even imagine playing with a doll that he gave me for my very own. I shared my deepest secrets with him and he was always with me. I can remember being laughed at when I was discovered under my bed talking to my friend. I was considered a troubled child because I talked to myself so much. I never tried to explain that I was talking to my friend Jesus. I was very bright in school, took piano for seven years and hated it because if I missed a note I would be struck across the knuckles with a ruler. When I played perfectly, I received nothing for my efforts. The only recognition I remember was the corporal punishment for any wrong I did or mistakes I made. I was never touched by another person unless it was a slap across the face or being pushed to my knees on a hardwood floor where I would kneel for hours at a time, or be shaken until I would lose my balance and fall to the floor. I spent endless nights on my little knees on the hardwood floor for punishment and swear to this day this is the reason I have arthritis in my knees. My only friend, Jesus, is how I survived through this time in my life. I didn’t see Jesus as others did in school. I thought of him as my playmate, my friend, my “hero”. As I grew to be an adult, I didn't know I needed help. All I knew was I was supposed to be strong and handle my feelings myself. I didn't try to talk to anyone because I didn't know how to. There have been times in my life that depression would hit me and would literally paralyze me. It would be hard to put one foot in front of the other for my body would feel so heavy that I didn't have the strength to carry it. When it would rain my feelings of depression would be so bad that I couldn't function and all I wanted to do was crawl under my covers in bed and hide there. I finally realized something was very wrong and missing in my life. When I started seeking help from professionals, I found I could not explain why I felt the way I did. I prayed endlessly for help from above. I think I have taken every medication known for depression and even medicated myself with vitamins and later with alcohol and drugs. None of these remedies helped; by the grace of God I gave up the alcohol and the drugs and just learned to live with my condition. After hearing about Alchemical Hypnosis I enrolled in the Alchemy Institute to become a Hypnotherapist. I had the desire to help others like me find some kind of relief. I found friendship among the other students and I experienced a closeness I had never known. I found understanding and genuine caring from others who had problems similar to mine. I learned through David Quigley that I didn't have to continue longing to have my needs met because everything I needed was inside my heart and mind. It was simply blocked and secured with walls of steel I had been building up for years as protection. David taught me how to break through the walls and bring in all that I needed in my life. Friends, family, a lover, a mother - all the people I had never had in my life could be found in the corners of my mind and heart just like I had made Jesus my inner friend as a child. I learned I no longer had to be alone and feel unloved and unwanted. All I had to do was close my eyes and summon the family within to guide and support me with the love I had never known. All I needed and longed for all of my life has been right there waiting for me to discover. This was easy for me to do because I already knew the creative power of my mind. I had learned this as a child. One of the real benefits of having an inner loving family is I didn't have to worry about being hurt, neglected, punished or ignored by them. These are the things that had always kept me from having healthy relationships or asking for help for fear of being hurt or rejected. I no longer feel rejected, hurt, lost, or in someone's way. I no longer feel I need someone to talk to that can be trusted with my most inner secrets for I have all that I need within me. Now I’ve learned how to trust and talk to others without that crippling fear. Depression is a crippling disease that can scarcely be understood by anyone who has not suffered from it. It can make you sick physically, as well as mentally. It can cripple growth, it can stop advancement in your life, interfere with sleep, eating habits, even physical hygiene. I have wanted to die more times than I have wanted to live. I have tried suicide several times just to end up being saved and feeling even worse and embarrassed for trying to take my life. I felt ashamed for getting attention I didn't deserve. I hated myself and didn't know why. I still have my trials and tribulations but now I have tools to help me cope, through the teachings of Alchemy, David, his staff and the many friends I made. Attending the training has helped me more than any medications I have taken and more than any of the professionals I have seen over the years. I owe so much to David and his staff for the teachings and individual caring I received and still receive from them. They are my family and I'm forever grateful. I now know how to meet my needs through my inner family and the outer family of Alchemical Hypnotherapists. I now have a sense of security and know my life is worth living.